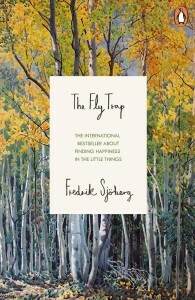 Fredrik Sjöberg’s „The Fly Trap“ has been nominated for the Russian Yasnaya Polyana Award 2016. Last year Japanese-American author Ruth Ozeki got the first prize for her book „A Tale for the Time Being“. This year the longlist features 31 books from different authors all around the world, from India to the U.S.
Fredrik Sjöberg’s Swedish bestseller about summer, islands, freedom and boundaries. Fredrik Sjöberg finds happiness in the little things. Millions of them, in fact. This beguiling bestseller is his unique meditation on collecting hoverflies. It is also about living on a remote Swedish island, blissful long summer nights, lost loves, unexpected treasures, art, nature, slowness, and how freedom can come from the things we least expect. The author: Fredrik Sjöberg collects hoverflies on the island Runmarö, in the archipelago east of Stockholm. He is also a literary critic, translator, cultural columnist and the author of several books including The Art of Flight and The Raisin King, which form a trilogy with The Fly Trap.